You put sunscreen on your skin so that you will be protected from the sun’s harmful rays. It’s your body’s largest organ and you ought to know what you’re putting on it. Not knowing what you apply your skin should scare the hell out of you, right? And that is why we review the ​​best su​nscreens for surfing here. There are a thousand options when it comes to sun​blocks, which makes picking the right one confusing. Some of these products can even harm the environment. In this review roundup, we will highlight some of our top picks. We’ll tell you what we didn’t like and what was great about them, and we’ll highlight the ones that give you the best value for your money. In this section, we will go over some of ​our favorite sunscreens for surfing. We will list each product’s highlights and the reasons why we like them. We will also include any negatives to give you a balanced view of these products. Note that they are not arranged in any particular order. 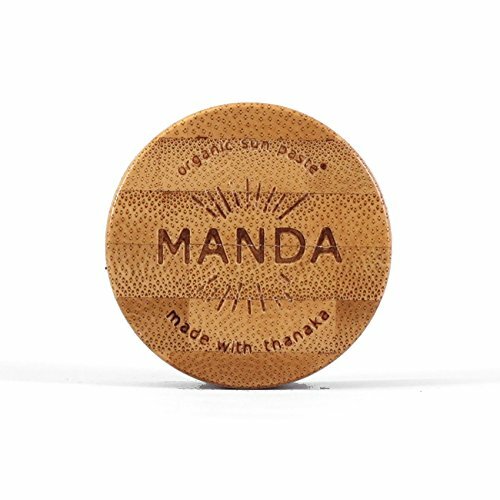 Th​e ​​​ Manda Organic Sun Paste smells faintly of chocolate and cinnamon. It doesn’t only smell good and delicious, it sure looks edible enough – a beige colored paste in a wooden tub. The product is packaged in 15g and 40g tubs. Given its price and the size of the tubs, you can say that this product is a bit pricey. It’s a product by surfers for surfers – which means it is designed to stay on your skin for a while (about 2 hours before some needed reapplication). On top of that, it is made with food grade ingredients like beeswax, cocoa powder, cinnamon oil, cocoa and shea butters, and coconut oil. This product is also environment friendly since it doesn’t contain any octinoxate or oxybenzone. Note that 8 million pounds of sunscreen ingredients find their way into coral reefs each year – this product doesn’t contribute to that. This is a cheaper alternative in our list of ​sunblocks. 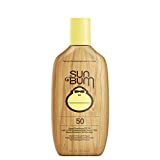 Note that the ​​​ Sun Bum Signature Lotion is a physical blocker. It is broad spectrum and it stays on for 80 minutes – but we recommend reapplying it after an hour. The product is packed in a black plastic easy open bottle. Each bottle contains 88 ml of the product or 3.0 Fl. Oz. It’s great for everyday use. It is a good option for adults and kids. And on top of that it is hypoallergenic – if you’ve got sensitive skin then this might be the sunscreen you’re looking for. Customers who have used this sunscreen say that it feels good on the face even with everyday use. Some people even compare it to professional sport sunscreen brands. 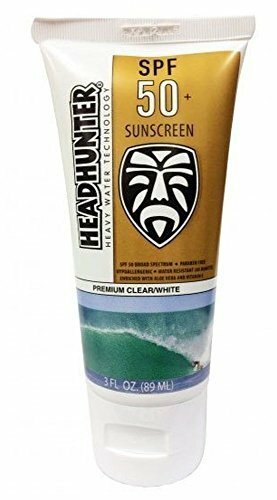 Th​e ​​ Headhunter SPF 50 Clear Sunscreen comes in two colors – brown (kind of gives you a tanned like look) and white. This product is also hypoallergenic – if you have sensitive skin then this could be a good option for you. It is packed in a plastic easy squeeze tube, like the ones for toothpaste. Each tube contains 90 ml of the product. ​This sunscreen also doesn’t leave that icky feel on your skin. It’s thick but it feels good when you have it on. We recommend this for people who tend to stay in the water for a full surf session. There are users who report that it doesn’t burn their eyes when they surf. There are those with sensitive skin who say they had no issues using this product. This product isn’t exactly a sunscreen for your face and body. But we thought it would complete the entire package to include a lip balm sunscreen ​on the list. 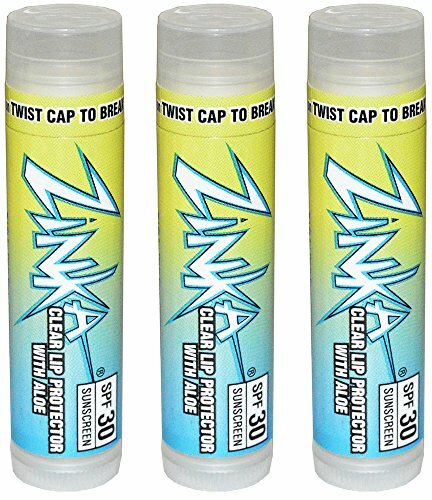 Each package of ​​ Zinka SPF 30 Sunscreen Clear Lip Balm with Aloe will contain 3 sticks of lip balm. Each pack will contain 3 x 0.15 ounces. The main ingredients of this product are 10% Octocrylene and 7.50% Octinoxate. Octocrylene is this product’s sunscreen ingredient and it is SPF 30. We love the fact that this lip balm slash sunscreen is gentle on the skin. It smells good and it doesn’t make the skin on your lips peel even after being out in the sun for an entire day. This is another one of the more expensive options on our list. However, you can consider it as an investment since everyone needs a way to provide a layer of protection for their facial skin. Each pack of this product contains 0.39 ounces. It is packaged like a lipstick tube. One of the biggest reasons why we included ​​​​ Vertra Natural Beige SPF 35 Face Stick on our list is because it comes highly recommended by the Hawaiian Lifeguard Association. ​If professional lifeguards trust and recommend this product, there’s a good reason to try it, right? You can say that it is a professional grade sunscreen for the face. Note that this product is ​water resistant. It is also non-phototoxic; which means that it will not cause any allergic reactions. That means it could be a great option for people who have sensitive or easily irritable skin. 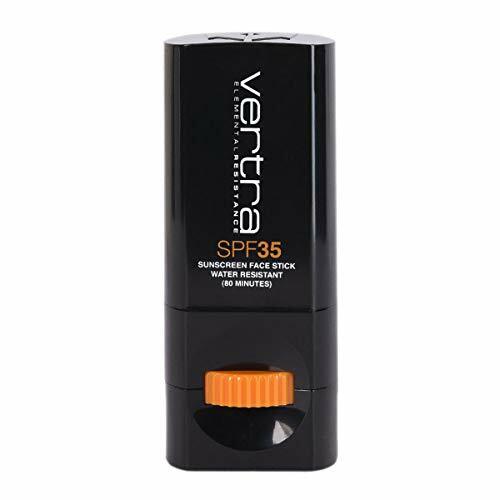 ​The Vertra face stick provides a broad spectrum of protection. That means it protects your skin from both UVA and UVB rays. It comes in a natural beige color and tone, which can be both a pro and con depending on how you want your sunscreen. Yes, it will make your face look odd a little bit but at least you know this product is still working, right? When you’re in the market for ​a sunscreen, one of the things that you should be considering is whether you’re getting a physical blocker or a chemical blocker. Those are basically the two forms of sunscreen you are going to choose from. Physical blocker sunscreens are also known as mineral blockers. On the other hand, chemical blocker sunscreens are also called organic sunscreens. Yes, “chemical” in the world of skin protection of this kind means “organic”. So, what’s the difference between these two? Well, each of them has their own pros and cons. Let’s ​dive into it. Chemical blockers or organic sunscreens absorb the ultraviolet radiation from the sun. That is how they stop the sun’s harmful rays from penetrating into the skin. Ingredients such as octinoxate, homosalate, octocrylene, octisalate, avobenzone, and oxybenzone absorb UV radiation. Sunscreens of this type aren’t visible on the skin. However, you should check the label carefully. There are organic sunscreens that are loaded with nasty toxins, like oxybenzone, for instance, that can harm the environment. Physical blockers or inorganic sunscreens act differently from organic sunscreen. Instead of absorbing UV radiation they reflect it before it gets to your skin. They contain ingredients like titanium oxide and zinc oxide that effectively blocks and reflects ultraviolet radiation. This type of sunscreen is considered to be safer. The only downside is that they remain visible on your skin i.e. you get a white ghastly hue. The American Cancer Society (ACS) has published a set of guidelines that we can use when we are in the market for sunscreen. They also stress that they should be followed especially during summer when the sun is stronger and the days are longer. They also emphasize that we should read the labels. Note that the FDA has required all sunscreen manufacturers to follow their guidelines when printing labels, which makes them easier for consumers to understand. When the label says a sunscreen has broad spectrum protection, it means that the product protects against UVA as well as UVB. Note that it is UVB rays that cause skin cancer and sunburns. This is the thing that is usually touted on the label. Sun Protection Factor refers to the level of sun protection your sunscreen can provide. The American Sunscreen Society recommends getting one that has SPF 30 or higher. Note that there is no such thing as a sunscreen that can give you 100% protection. Even if it says it has SPF 100 it can only provide you with 99% protection. 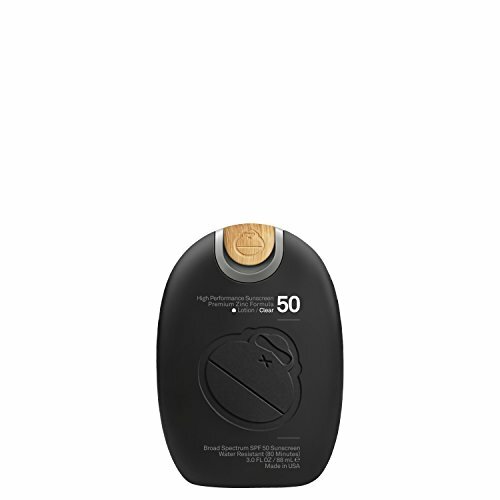 SPF 50 gives you 98% protection while SPF 30 can only filter out 97% of UVB rays. We’ve been out surfing for quite a while and ​we know that there is no such thing as “waterproof” sunscreen. In fact, the ACS says the same thing. Now, FDA regulations say that the label should not only tell you if the product is water resistant or not. It should also tell you if the product can last 4​0 minutes when you’re in the water or maybe 80 minutes when you sweat. What are our thoughts on the matter? Best practice tells us that you should reapply sunscreen every 2 hours even if the product label tells you that it will be water resistant for 8 hours. ​We know from past experience that the effectiveness of sunscreens decrease when you sweat or when you’re in the water. When you surf, you are actually doing both. Yes, you sweat while surfing even if you don’t notice it. If you want to find the ​right sunscreen for surfing then you better test your sunscreen ​while you surf, just to be sure. So, which product is the best option overall? Our pick for the best sunscreen for surfing is the ​​​​ Sun Bum Signature Lotion. We loved it because it is a great option for the entire family – even your kids can use it. It’s gentle on the skin and it stays on. It can be used for both the face and the body. It’s also hypo allergenic, which is great for people with sensitive skin.